The Jewish New Year, Rosh Hashanah, will begin at sunset on Monday evening. There are many traditional foods that Jews eat to celebrate the arrival of a new year. 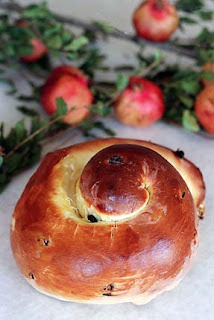 On Rosh Hashanah, Jews eat a round challah (loaf of egg bread) with raisins. The round challah represents the cycle of the year and the cycle of life. For the New Year, Jews also eat apples dipped in honey, to celebrate the sweetness of welcoming a New Year together with family and friends. A recent article in the Forward newspaper brought to light a surprising culinary connection between Rosh Hashanah and fish. Jews from Morocco will cook an entire white fish or trout, head and all, and serve it as a delicacy during the Rosh Hashanah meal. The custom of serving the fish with its head is a reminder of the literal meaning of the word Rosh Hashanah, “head of the year.” Another custom is to serve the first portion of the fish to the head of the table. 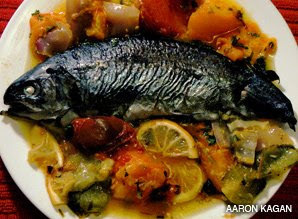 Picture: Moroccan Baked White Fish from The Forward Newspaper website. As a rabbi who loves to fly fish, I may well adopt this Jewish culinary tradition of Morocco and cook an entire fish for the New Year. The only question will be: brook, brown or rainbow trout? Below is a recipe for Baked White Fish or Moroccan Pecado Blanco from: Joan Nathan’s Jewish Holiday Cookbook. My best wishes for a sweet, joyful and happy New Year. 1. Place the entire fish in a glass or earthenware baking dish. 2. Stuff the fish with most of the parsley and garlic. Surround the fish with the remaining parsley and garlic, the tomatoes, green pepper, and lemons. 3. Dissolve the saffron in about ½ cup boiling water and let it sit for a few minutes. Then sprinkle the saffron water over the fish and tomatoes. 4. Prehead oven to 350 degrees. 5. Pour the oil around the fish and tomatoes. Bake, uncovered, for 30 minutes, or until golden and crisp. It might take a while for me to find a five pound trout! Good luck in your quest for the five pounder Daniel. 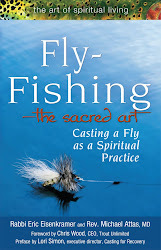 If only we could catch a nice five pound trout for the new year!